This Wednesday the SWP in Leicester are hosting a meeting about Socialists and the election. The upcoming general election raises several important questions for Socialists. Obviously we want to get rid of the hated Tories, but at the same time the Labour party has betrayed working class people over and over again over the last few decades. Socialists need to be fighting for a party that truly represents the working class at the ballot box. The Trade Union and Socialist Coalition is an important step towards this goal. We have several TUSC candidates standing here in Leicester. However in some areas Socialist candidates will not be standing. Who should we vote for in these situations? Several parties such as the Greens, SNP and Plaid Cymru are on the face of it anti-austerity. Come along and discuss these questions at the meeting on Wednesday. 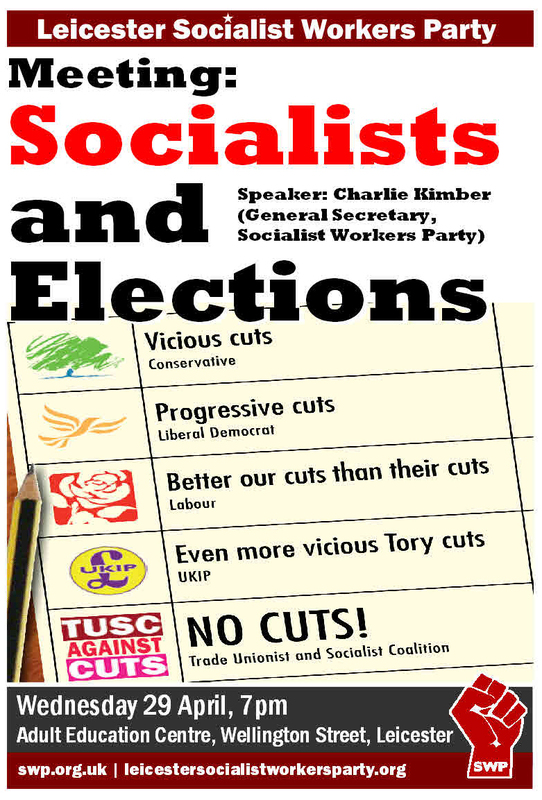 The SWP’s Charlie Kimber will be speaking and a discussion will follow. The meeting is on Wednesday 29 April, 7pm at the Adult Education Centre, Wellington St, Leicester. This entry was posted on Apr 25, 2015 by leicestersocialistworkersparty in Labour, Labour Party, marxism, Meetings, NHS, Privatisation, UKIP and tagged Elections.